[S312] Social Security Death Index, online at http://tinyurl.com/AncestrySSDI, viewed on 30 Mar 1998 (stating that he died in Nov 1982; not naming the place of death but stating that he lived in Brownsville, Texas when he died and that last benefits were mailed to an address in Brownsville, Texas). [S312] Social Security Death Index, online at http://tinyurl.com/AncestrySSDI, viewed on 30 Mar 1998 (not naming the place of death but stating that she lived in La Marque, Texas when she died). • His Find A Grave memorial, which includes pictures of his grave site and tombstone, is here. [S961] Find A Grave, online at http://www.findagrave.com, memorial for Bird Babbitt Pullen, memorial no. 139695594, viewed on 6 Jul 2015 (naming Jessie Pullen as his father). [S961] Find A Grave, online, above, memorial for Bird Babbitt Pullen, memorial no. 139695594, viewed on 6 Jul 2015. [S961] Find A Grave, online, above, memorial for Bird Babbitt Pullen, memorial no. 139695594, viewed on 6 Jul 2015 (naming Bird Babbitt Pullen as her father). [S961] Find A Grave, online, above, memorial for Rosalie Harriet Pullen Emmert, memorial no. 72483552, viewed on 6 Jul 2015 (naming Bird Babbitt Pullen as her father). [S408] Emmett L. Whitsett, Jr., San Antonio, Tex., descendancy chart for Frances Mary McFadin Pullen sent to Roger Bartlett, 26 Mar 1998. 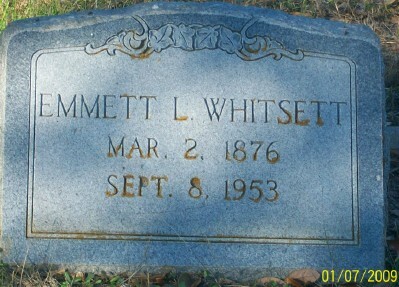 Emmett L. Whitsett's tombstone, City Cemetery, Floresville, Tex., from findagrave.com, by Cindy Fannin. [S408] Emmett L. Whitsett, Jr., San Antonio, Tex., descendancy chart for Frances Mary McFadin Pullen sent to Roger Bartlett, 26 Mar 1998 (naming Samuel Jefferson Whitsett as his father). [S1238] "A Guide to the Samuel J. Whitsett Family Papers, 1841, 1870-1906," online at http://www.lib.utexas.edu/taro/drtsa/00144/drt-00144.html, viewed on 12 Mar 2012 (naming Samuel Jefferson Whitsett as his father). [S961] Find A Grave, online at http://www.findagrave.com, memorial for Emmett Lyons Whitsett, memorial no. 32696694 (giving the date but no other information). [S1238] "A Guide to the Samuel J. Whitsett Family Papers, 1841, 1870-1906," online, above (giving the year but no other information). [S961] Find A Grave, online, above, memorial for Emmett Lyons Whitsett, memorial no. 32696694. [S520] Irma M. Meyr, Cemeteries of Wilson County, Texas (n.p. : n.pub., n.d.), p. 126 (giving the date but not the place). [S961] Find A Grave, online at http://www.findagrave.com, memorial for Nora Camp Whitsett, memorial no. 28288068, viewed on 16 Aug 2013. [S11] Index to Texas Death Records (Austin, Tex. : Tex. Dept. of Health, Bur. of Vital Statistics), typescript, 1962, vol. 3, p. 1416, file 34042 (giving the date, county, and state). [S961] Find A Grave, online, above, memorial for Nora Camp Whitsett, memorial no. 28288068, viewed on 16 Aug 2013 (giving the date and county). [S520] Irma M. Meyr, Cemeteries of Wilson County, Texas, above, p. 126 (not giving the date). [S961] Find A Grave, online, above, memorial for Nora Camp Whitsett, memorial no. 28288068, viewed on 16 Aug 2013 (attributing some information to her obituary in the San Antonio Express, San Antonio, Tex., p. 3A, on 25 Jun 1962). [S961] Find A Grave, online, above, memorial for Nora Camp Whitsett, memorial no. 28288068, viewed on 16 Aug 2013 (giving her name as Nora Camp Whitsett). [S961] Find A Grave, online, above, memorial for Nora Camp Whitsett, memorial no. 28288068, viewed on 16 Aug 2013 (attributing information to her obituary in the San Antonio Express, San Antonio, Tex., p. 3A, on 25 Jun 1962). Marriage*: She married James H. Brown. Other Names*: Ola Whitsett Brown, Ola Brown. [S408] Emmett L. Whitsett, Jr., San Antonio, Tex., descendancy chart for Frances Mary McFadin Pullen sent to Roger Bartlett, 26 Mar 1998 (naming Samuel Jefferson Whitsett as her father). [S1238] "A Guide to the Samuel J. Whitsett Family Papers, 1841, 1870-1906," online at http://www.lib.utexas.edu/taro/drtsa/00144/drt-00144.html, viewed on 12 Mar 2012 (naming Samuel Jefferson Whitsett as her father). [S408] Emmett L. Whitsett, Jr., 26 Mar 1998 descendancy chart, above (stating she was born circa 1878). [S408] Emmett L. Whitsett, Jr., 26 Mar 1998 descendancy chart, above (stating she died circa 1934). Marriage*: He married Ola Whitsett, daughter of Samuel Jefferson Whitsett and Rhoda Frances ('Fannie') Pullen. Ada Whitsett and James Henry Bain on their wedding day, 22 Apr 1903, courtesy of Karlen Bruner Bain. Other Names*: Ada Whitsett Bain, Ada Bain. [S312] Social Security Death Index, online at http://tinyurl.com/AncestrySSDI, viewed on 7 Apr 1998 (giving only the date). [S408] Emmett L. Whitsett, Jr., 26 Mar 1998 descendancy chart, above (giving only the date). [S312] Social Security Death Index, online at http://tinyurl.com/AncestrySSDI, viewed on 7 Apr 1998 (stating that she died in Jan 1966 and not naming the place of death). [S433] Karlen Bain, electronic mail to Roger Bartlett, 25 Oct 1998. [S408] Emmett L. Whitsett, Jr., 26 Mar 1998 descendancy chart, above (naming Ada Whitsett as his mother). James Henry Bain and Ada Whitsett on their wedding day, 22 Apr 1903, courtesy of Karlen Bruner Bain. Birth*: He was born on 13 April 1881 in Navarro County, Texas. Death*: He died on 12 July 1943 in Kerrville, Kerr County, Texas, at age 62. [S408] Emmett L. Whitsett, Jr., San Antonio, Tex., descendancy chart for Frances Mary McFadin Pullen sent to Roger Bartlett, 26 Mar 1998 (giving only the date). [S408] Emmett L. Whitsett, Jr., 26 Mar 1998 descendancy chart, above (naming James H. Bain as his father). [S408] Emmett L. Whitsett, Jr., San Antonio, Tex., descendancy chart for Frances Mary McFadin Pullen sent to Roger Bartlett, 26 Mar 1998 (naming James H. Bain as his father). [S408] Emmett L. Whitsett, Jr., 26 Mar 1998 descendancy chart, above (not giving the date or naming the place). [S312] Social Security Death Index, online at http://tinyurl.com/AncestrySSDI, viewed on 24 Feb 1998 (stating that he died in May 1965 and not naming the place of death). [S11] Index to Texas Death Records (Austin, Tex. : Tex. Dept. of Health, Bur. of Vital Statistics), typescript, 1965, vol. 1, p. 56, file 31065 (giving the date, county, and state). [S408] Emmett L. Whitsett, Jr., 26 Mar 1998 descendancy chart, above (naming Travis Whitsett Bain as his father). [S124] Austin American-Statesman, Austin, Tex., 15 Jul 1998, p. B7 (obituary of Zelma Middleton Bain). [S312] Social Security Death Index, online at http://tinyurl.com/AncestrySSDI, viewed on 23 Jan 1999 (giving only the date). [S408] Emmett L. Whitsett, Jr., San Antonio, Tex., descendancy chart for Frances Mary McFadin Pullen sent to Roger Bartlett, 26 Mar 1998 (not giving the date or naming the place). [S312] Social Security Death Index, online at http://tinyurl.com/AncestrySSDI, viewed on 23 Jan 1999 (not naming the place of death but stating that she lived in Fort Worth, Texas when she died). James Henry ('Jim') Bain Jr.
[S408] Emmett L. Whitsett, Jr., 26 Mar 1998 descendancy chart, above (giving her surname as Eardley and not giving the date or naming the place). [S408] Emmett L. Whitsett, Jr., San Antonio, Tex., descendancy chart for Frances Mary McFadin Pullen sent to Roger Bartlett, 26 Mar 1998 (giving her surname as Eardley and not giving the date or naming the place). [S312] Social Security Death Index, online at http://tinyurl.com/AncestrySSDI, viewed on 24 Feb 1998 (not naming the place of death but stating that she lived in Stockdale, Texas when she died). [S408] Emmett L. Whitsett, Jr., 26 Mar 1998 descendancy chart, above (naming William Woodrow Bain as his father). [S312] Social Security Death Index, online at http://tinyurl.com/AncestrySSDI, viewed on 17 May 2003 (giving the date but not naming the place). [S312] Social Security Death Index, online at http://tinyurl.com/AncestrySSDI, viewed on 17 May 2003 (stating that he died in Mar 1984; not naming the place of death but stating that he lived in Roswell, N.M. when he died and that last benefits were sent to an address in Roswell, N.M.). [S835] Shannon McFadin, electronic mail to Roger Bartlett, 7 May 2003, (stating that he died in 1984). Marriage*: He married Fanny Catherine ('Fanny Kate') McFarlin. [S282] Delayed certificate of birth (Texas Department of Health, Bureau of Vital Statistics) no. 31355 for Frances Imogene Bullington, filed with Bureau of Vital Statistics on 15 Sep 1961, per copy provided by Robin Abb to Roger Bartlett on 25 Aug 1997, (naming William Franklin Bullington as her father). Marriage*: She married William Franklin Bullington. [S282] Delayed certificate of birth (Texas Department of Health, Bureau of Vital Statistics) no. 31355 for Frances Imogene Bullington, filed with Bureau of Vital Statistics on 15 Sep 1961, per copy provided by Robin Abb to Roger Bartlett on 25 Aug 1997, (giving only the place). [S618] Teresa Shands, electronic mail to Roger Bartlett, 15 Apr 2001. [S282] Birth certificate for Frances Imogene Bullington, above, (naming Fanny Catherine McFarlin as her mother). [S283] Linda Green, electronic mail to Roger Bartlett, 15 Aug 1997. [S284] Linda Green, electronic mail to Roger Bartlett, 28 Aug 1997, (naming Meredith ap Jevan as his father). Marriage*: She married John Wynne, son of Meredith ap Jevan and _____ _____. Marriage*: She married Meredith ap Jevan. [S1128] GGentry, electronic mail to e-mail address, 22 Jul 2003, (giving only the year and not naming the place). [S286] Don Johnston, electronic mail to Roger Bartlett, 8 Sep 1997, (not giving the date or place). [S1128] GGentry, electronic mail to e-mail address, 22 Jul 2003. [S1128] GGentry, electronic mail to e-mail address, 22 Jul 2003, (naming Samuel Travers as her father). [S1130] Walter S. Allerton, A History of the Allerton Family in the United States, 1585 to 1885, and a Genealogy of the Descendants of Isaac Allerton, "Mayflower Pilgrim," Plymouth, Mass., 1620 (Chicago, Ill.: Samuel Waters Allerton, 1900), p. 34 (naming Capt. Samuel Travers as her father). [S1128] GGentry, electronic mail to e-mail address, 22 Jul 2003, (naming Francis [sic] Allerton as her mother). [S1130] Walter S. Allerton, A History of the Allerton Family in the United States, above, p. 34 (naming Frances Allerton as her mother). [S1129] Janean Ray, electronic mail to e-mail address, 22 Jul 2003, (giving the date but not the place). [S286] Don Johnston, electronic mail to Roger Bartlett, 8 Sep 1997, (naming John Taverner as her father). [S286] Don Johnston, electronic mail to Roger Bartlett, 8 Sep 1997, (naming Elizabeth _____ as her mother).